Auletta said he’s often asked if about Sorrell’s being ousted from WPP after Frenemies was written, and whether this muted the message of the book. Ken Auletta, the writer behind The New Yorker’s “Annals of Communications” profiles, followed up the New York Times bestseller, Googled, with a thorough look inside the advertising industry. Adweek caught up with Auletta to discuss some of the book’s key take-aways. Auletta said he’s often asked if about Sorrell’s being ousted from WPP after Frenemies was written, and whether this muted the message of the book—a contention with which he strongly disagrees. Auletta told Adweek that Sorrell remains a “large historical figure” whose legacy remains securely in place. Replacing such a titanic figure in the industry is no easy task, he added. Auletta also discussed the harassment case Erin Johnson brought against WPP and former JWT New York CEO Gustavo Martinez, who relocated to Spain and continued to work for WPP following Johnson’s allegations. WPP parted ways with Martinez just last week, two months after settling with Johnson and ahead of today’s board meeting. While Sorrell’s departure may mean that the industry’s largest holding company is without advertising’s most recognizable ambassador, Sorrell is far from the only colorful character in the industry. Auletta cited several such large personalities in the business. He added that R/GA founder Bob Greenberg is “a very interesting creative guy” who “rides to work on his motorcycle” with “brill-like long hair that flows below his shoulders” complete with a black cap. 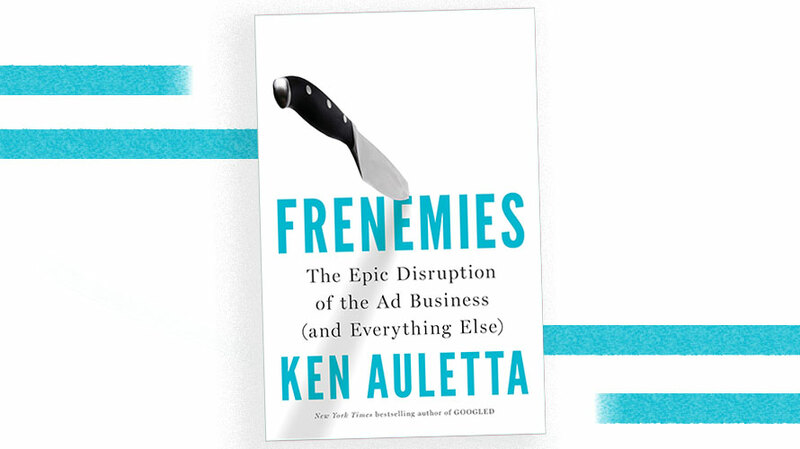 The title of Auletta’s book references what has become a common thread in the industry: parties that agencies both depend on and compete with. That includes the usual candidates such as Google, Facebook and Amazon, which maintain a pronounced advantage over even the most advanced agency consumer data offerings, such as those of GroupM; it also includes global consultancies like Accenture and Deloitte, which command a pronounced size advantage over agencies and greater influence over the c-suite of clients. PR agencies and publishers’ in-house content units are also elbowing their way onto agencies’ turf.